Over ten million died as a result of the First World War. Mindful that the great loss of these soldiers should not be forgotten, many artists chose to focus on their absence. This was something common across British, French and German artworks. 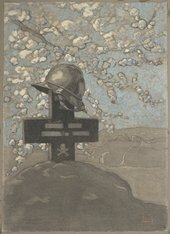 Paul Jouve’s Grave of a Serbian solider at Kenali 1917 depicts a soldier’s grave at the battle scene. His helmet rests on the gravestone. This unworn helmet, rather than the grave, is the focus of Jouve’s painting. The helmet became a motif in many artworks as a symbol of loss. It stood for the patriotism and sacrifice of the soldier. Other artists chose to explore the absence of a loved one more personally. Kathe Kollwitz’s The Parents is a woodcut depicting two grieving parents. Kollwitz had lost her son Peter. He died while serving in Flanders in October 1914. Rather than a portrait of her son, she displays the grief she and her husband felt in his absence. In a way that differed to war propaganda, both these artists depicted loss as futile. The memorials we continue to visit today were made to remind future generations of the war and to be a place to mourn and grieve. In 1919, Paris’s Les Fêtes de la Victoire and London’s Peace Day Parade used a Cenotaph or empty tomb as the focal point of their remembrance. Germany’s first official memorial was not until Berlin’s Neue Wache in 1931, but before this sculptors had created monuments that reflected on the war. After three months service, Ernst Barlach returned home from the war a pacifist. His artwork became increasingly popular as a result. His Der Schwebende, commissioned for Güstrow Cathedral in 1927, was a bronze sculpture of a floating angel. It was a memorial for the fallen. The horizontal, passive stance is a direct contrast to the active aggression of the soldier. In 1937, it was melted down by the Nazis for its anti-war view. They wished to glorify those who had sacrificed themselves for their country. Today, Barlach's sculpture has been recast and has been exhibited all over the world. 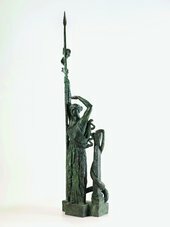 Antoine Bourdelle’s France, first created in 1922, depicts a personified version of France as the Greek goddess of wisdom and war, Pallas Athene, looking out for America. It reimagines when America entered the war in 1917 to help their allies. Bourdelle called it his greatest masterpiece. Since, the sculpture has been recast for display several times, most famously in Boston and Paris. Memorials such as these often became public monuments that were accessible and notable to all. They continue to carry out their purpose to remind us of the tragedies of war. Unable to comprehend the harsh realities of war, artists began looking at more unconventional ways to express themselves. The founders of the surrealist movement, André Breton and Louis Aragon, had been medical students at a military hospital in Paris in 1917. They had been eyewitnesses to the horror of the war and how this had damaged the bodies of its victims. While an effort was made by artists like Henry Tonks to document the wounds soldiers had experienced, the surrealists felt these articles were unable to fully realise the horror of the experience. The German Max Ernst was a key artist working within the surrealist movement. His Celebes presents a fragmented body and a tank, elephant-like in stature. 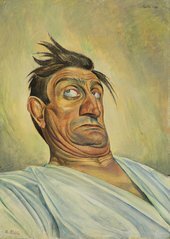 Ernst explores the distorted post-war psyche, affected by shellshock and trauma. The suggested meaning is that the individual, notably female, is helpless against the might of the machine. Confused and disorientated, artists began to make art that posed more questions than it answered. Likewise, the dada movement that began in Zurich was a direct reaction to the war. It subverted traditional ideas and satirised war rhetoric. Kurt Schwitters’ artwork takes ideas from both dada and surrealism and presents a fragmented vision of a post-war society. His Picture of Spatial Growths – Picture with Two Small Dogs is a collage of rubbish and printed ephemera from Germany in 1920. He added to the piece seventeen years later, creating various layers. Its collage form creates a messiness and disorder that relates to the struggling and bankrupt Weimar Germany Schwitters was working in. Everything had broken down ... new things had to be made from fragments ... new art forms out of the remains of a former culture. In complete contrast, some artists found security and stability in the past. They sought reassurance in the neo-romantic and pastoral landscapes that had dominated before the avant-garde artistic values of surrealism and dada. Artists, like Pablo Picasso and Georges Braque, became part of a movement known as Return to Order. They rejected the fragmentation of reality that had been common in their style before the war. Many of their post-war artworks show an effort to reproduce a sense of calmness. British artists, such as Winifred Knights sought similar through a revival of religious imagery. Her The Deluge won Knights a three-year scholarship at the British School in Rome. As a reimagining of Noah’s Ark, it illustrates contemporary society through biblical imagery. A crowd struggle to escape the flood, while the ark sails away in the distance. She equates biblical destruction with the destruction of the war. By turning to religion, Knights found a conventional way to express the feelings of a post-war society. Her painting though is far more modern and stylised. Its shadowy texture in place of lush greenery is perhaps influenced by the war-ravaged world she painted in. A return to tradition was wished for, but in most cases, it was difficult to realise. In the decade after the war, artists began envisioning a world where the war had acted as the catalyst for change. The future was experimental and bold, a symbol of hope and rebirth after the devastation of war. Newly enfranchised groups, such as women and the working classes became a focus. Social critique informed a revolution in the perception of these groups. The 1920s saw a shift in focus away from the elite. 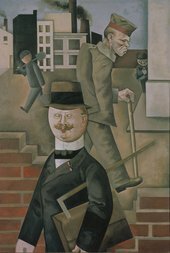 George Grosz’s Grey Day illustrates how the wealthy profited from war. In contrast, the disabled and forgotten veteran was left poor and divided from society. His painting literally separates the two groups by a brick wall. It is up to the viewer, however, as to decide whether this half-built wall is being constructed or brought down. In urban centres, jazz and dance culture became the trend. William Roberts’ The Jazz Club shows a liberated group, dressed in the new, less-conservative fashion of the day. The angular shapes give the bodies a new-found power. The colours, made up of bright reds and muted greens, show a new kind of social space, plain and practical rather than ornate. The world changed, absorbing the effects of war, whilst it rebuilt itself. Many women had been drafted into the workforce during the war. The artist Hilda Carline had served in the Women’s Land Army. She did farm work in Suffolk where she developed a fascination for the countryside. After the war, she trained at the Slade School of Art under the guidance of Henry Tonks. While landscape was the main focus of her paintings, her portraiture reflected a new society where women were independent and able to sustain jobs. 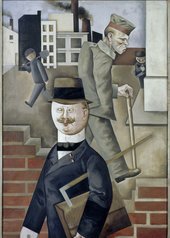 Self-portrait is an example of how Carline envisioned the new working woman. Her gaze is firm and directed at the viewer. Painted in 1923, it shows what strides were made in the five years after the war ended and the vote was extended to women. The context of the artwork positions the war as a catalyst that helped lift some of the restraints on women. As the medium of art changed and became more expansive, artists revisited the war to reflect on its legacy in new ways. Photography showed the lasting impacts of war and represented a far more realistic and directed depiction than painting. Don McCullin’s The Battlefields of the Somme, France is a 2000 photograph in harsh monochrome. It shows the modern landscape and invites the viewer to imagine the battle once taking place on this sparse plain. The black and white colouring filters out any colour and suggests a darker, more sombre meaning than perhaps the green fields would to the naked eye. In the same way, Erinnerung aus dem Weltkrieg by Tacita Dean is a 2001 photograph that wishes to preserve the historical significance of the First World War. The photograph shows a German countryside ravaged by bombing raids in the war. The title roughly translates as ‘memories of the World War’. Again it is a black and white photograph signalling the past, but here Dean has etched words on to the photograph. Some of the text is an explanation that the image shows a ‘dead place’ on ‘the French/ German border’ where ‘not a soul remains’. Like McCullin, Dean uses photography to respond to the war and reflect on its significance in a twenty-first century context. Moving away from the visual, artist Susan Philipsz has responded to war through sound. Her War Damaged Musical Instruments was exhibited at Tate Britain to commemorate the war. The piece features fourteen recordings of British and German brass and wind instruments damaged in conflicts over the last 200 years. The music is based on The Last Post, a tune used to inform soldiers that it was safe to return to their base. Audiences today will recognise it as having been played at Remembrance ceremonies. In Philipsz's artwork the tune is distorted and fragmented, because of the damaged instruments. It is almost unrecognisable. The damaged melody represents the wounded and reminds us of their sacrifice. Relying on the labour of its Empire, Britain looked to African and Indian colonies to support the war effort. One tragedy of this has been that these soldiers and their narratives have been drowned out by their colonisers. Gerald Pryse was a British artist and lithographer during the war. His Indians and Motorbuses near Poperinghe is one of the few artworks that show the involvement of India in the war effort. More well-known, The Neuve-Chapelle Memorial exists in France to commorate 4, 742 Indian soliders who were given no grave. Both, however, were created by a western perspective. They do not give voice to the soliders from the Empire. Today, a new generation of artists from these backgrounds are responding to the war to tell the forgotten stories of those who fought. William Kentridge has created The Head and the Load to tell the experience of African porters who served in the British, French and German forces during the First World War. The piece will be performed at Tate Modern to recognise the contribution of these African men and women. It comes after the opening of the African and Caribbean War Memorial in Brixton, London that honours the fallen from these countries. In the centenary of the war’s end, it is hoped that these stories will be told and the losses of these men and women remembered.